Celebrity Chipotle Goat Cheese is made with 100% fresh and local, rGHB free milk, on the Mariposa family farm in Ontario, Canada. Mariposa goats are fed a specialized high-energy, high-protein diet of roasted soybeans that results in exceptional quality, richly flavored milk. 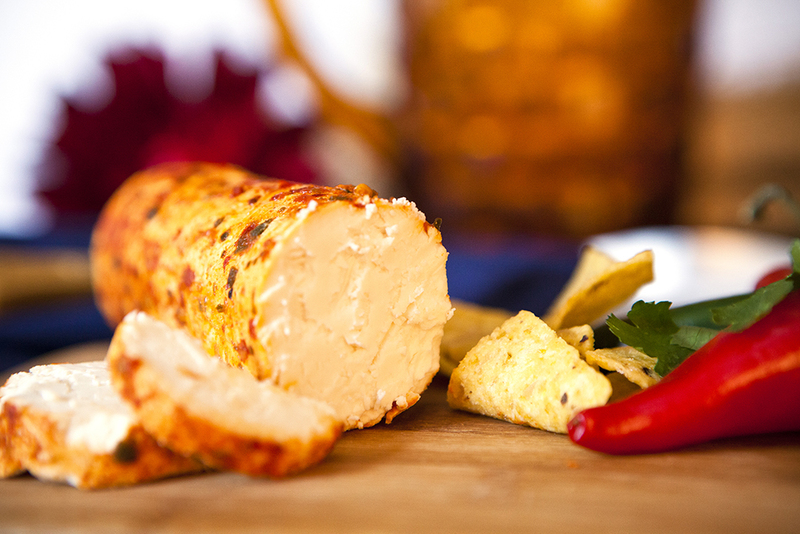 Celebrity Chipotle Goat Cheese logs are hand rolled in a special blend of jalapeno, chipotle pepper, garlic and other spices, giving an adventurous, but gentle kick to the soft, silky and creamy chevre. Goat cheese is, in general, great for a health conscious or lactose intolerant diet, since goat’s milk has a lower fat and cholesterol content and is higher in calcium and Vitamins A and D than cow’s milk. The health benefits of Celebrity Goat Cheeses are dimensionally increased since only pure sea salt, which doesn’t contain unwanted iodine, is used to bring out the milk’s delicate flavor. Celebrity’s all-natural goat’s milk logs are certified COR kosher, suitable for vegetarians and are Gluten free. Application: Chipotle Goat makes a beautiful presentation on a cheese board, is delicious simply spread on crusty bread or crackers and is great crumbled on salads, added to omelets, warmed for nachos or used for a vegetable dip. It will spice up sandwiches and burgers with medium hot flavor. Pairing: A traditional pairing with chevre is Sauvignon Blanc and while the spices might seem a challenge, the fruit forward style of New Zealand Sauvignon Blanc more than holds its own. DeMedici has captured the classic taste of Liguria with their all-natural, grissini style breadsticks, called “Brichetti” – “matches” in the Ligurian dialect, for their long, slender shape. Born out of a necessity to preserve bread for a longer period (DeMedici Brichetti has a shelf life is one year), these authentic Mediterranean crackers were typically served during holidays as accompaniments for meats and cheeses. Black Pepper Brichetti are made with traditional Ligurian ingredients: local Ligurian olive oil, grain, corn, black pepper and sea salt. They have a light, delicate texture and a delicious, crispy flavor with just the right accent of black pepper. DeMedici Black Pepper Brichetti adds the elegance and flavor of the Riviera to any table.